Astral Babylon is an extra level outside the story mode of Sonic Riders: Zero Gravity. 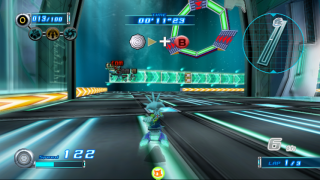 While it is the counterpart of Mobius Strip and thus technically the seventh Hero track, the course is not visited at all during the story, appearing only in normal play and mission modes. Nevertheless, Astral Babylon exerts a significant effect on the plot of the Sonic Riders series, representing as it does the underlying nature and purpose of the Babylon Rogues' ancestral home, Babylon Garden. Back in the original Sonic Riders, the lost floating city of Babylon Garden was once the home of the Babylon Rogues' alleged ancestors: a bird-genie people called the Babylonians. An ancient legend recounted by Tails in Splash Canyon tells how the Babylonians incurred the wrath of the Gods for their ill-defined crimes, and their city was "cast into the depths of the earth". In the next game, Zero Gravity, Knuckles uncovers more to the legend, with reference to 'divine wings' and the 'lightless black'. The truth about Babylon Garden is only discovered in the Last Story. The magnificent floating city is merely low-tech detritus, obscuring the superstructure's true form and purpose: that of an interstellar spaceship, Astral Babylon. Aeons ago, the alien ship suffered a drive malfunction above Sonic's world, forcing it to jettison the Arks of the Cosmos into orbit and crash-land. Marooned and crippled, the Babylonians constructed the Garden around their inoperable spacecraft, and eventually lost their history and technology, leaving only vague legends and the occasional artefact passed down by Jet's father. After Team Sonic and the Babylon Rogues thwart Eggman's plans in Security Corridor, the Arks of the Cosmos are stolen by the renegade MeteorTech robot SCR-HD. The artefacts start to resonate with Babylon Garden, causing the calamity that the Babylonian pilots condemned themselves to avoid: the lightless black. Astral Babylon's black hole drive explodes, tearing the Babylon Garden to pieces and annihilating the Crimson Tower with a gravitational tornado. After Sonic flies into the eye of the storm and destroys Master Core: ABIS, the black hole evaporates. Babylon Garden has been destroyed, but Astral Babylon remains, high in orbit. The Babylon Rogues gaze up at the new star from the desert plateau, before taking off on their boards. Part of the Babylonian spacecraft hidden for thousands of years inside Babylon Garden, this rectangular techno-course comes complete with automated airlocks and activatable ramps which trigger on riding over the Babylonian sigils. They may have survived millenia underground, but the vast glassy blocks that comprise the walls of the course don't fare well with Gravity Drives going off all over the place. The shattering walls provide ample opportunity for short-cuts; you can slice a lot of distance off your route by floating over the central void and landing back on the opposite track.